Over the years I have tried my hand at several different instruments, and although I seldom play anymore, I still love music and it still inspires me in other aspects of my life. 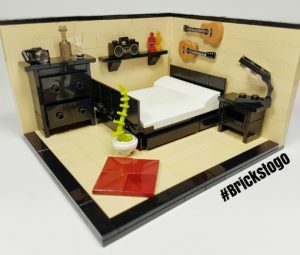 Music was obviously a huge inspiration for this MOC as I tried to envision what my room would look like if I were a musician. My favorite part of this build is the dresser on at the foot of the bed. I tried to replicate the shape of the furniture as best as I could, using all black to give that modern finish. Plus black is a great contrasting shade to the tan walls and floor. The dresser, nightstand, and red carpet are not actually attached to the floor, making this MOC quite delicate, especially when moving around. I don’t usually like leaving pieces resting without a proper connection, but because of the way I designed the legs using tiles at a 90 degree angle, there wasn’t really a way to do so. On a side note I was incredibly surprised to receive over 500 likes, which well surpasses my average. I had such great feedback from this design that it really showed me how supportive the Lego community is, and that it’s very easy to be overly critical of your own work.